Well, my blogging friends, I will be taking a nice 4 day weekend to enjoy with my kids. I’ll fill you in on all our “doings” when once again I fire up my trusty Mac. Before I turn my Mac off for the weekend I’d like to share a little tease of what I’m currently working on. 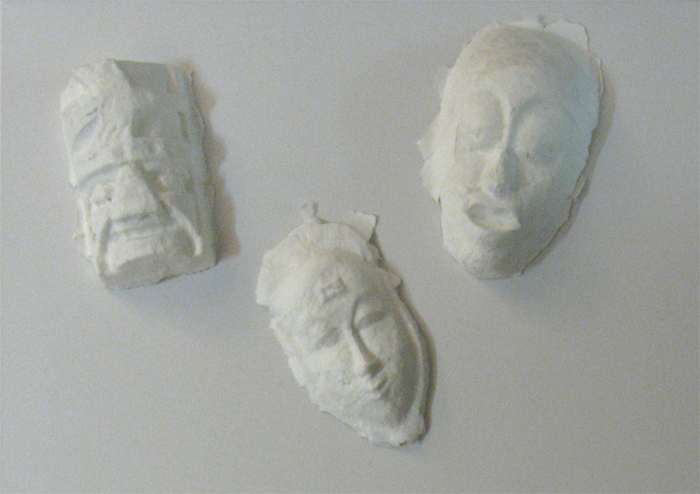 It is another in my multi-media/3d series which involves paper mache’ masks, acrylic paint and social commentary based on my own observations. 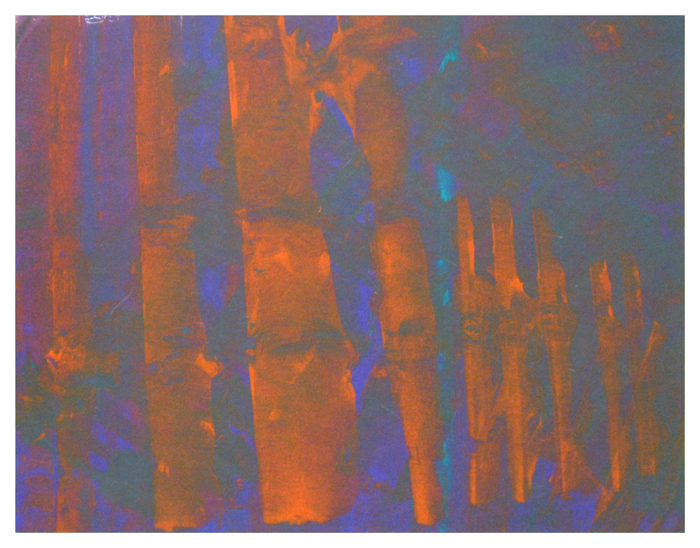 The only clue I will give you to go with these two images is that the final piece will be regarding the ironic images and words on certain pieces of paper we all use fairly regularly. 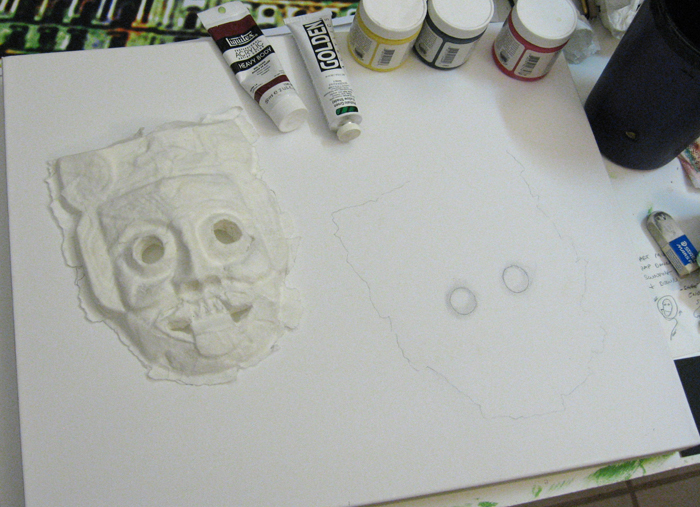 Above, you can see that I’ve chosen my palette and drawn in where the mask will find his final resting spot. If you notice the little scribblings to the right of the canvas, that has nothing to do with this piece, but everything to do with an upcoming one. I’m always making quick little notes as I create and have scraps of paper laying around my studio for just that purpose. I’ve been having a lot of fun the last few days working on some new stuff. I finished two over the weekend but will only post one of them for today. The other is unavailable until next week at which time I’ll share. As you can see below in the before/after image, a LOT of the schmeerings have disappeared. I think enough of them, plus the texture they created, remain for me to be able to include this in my Over the Under-Schmeerings series. 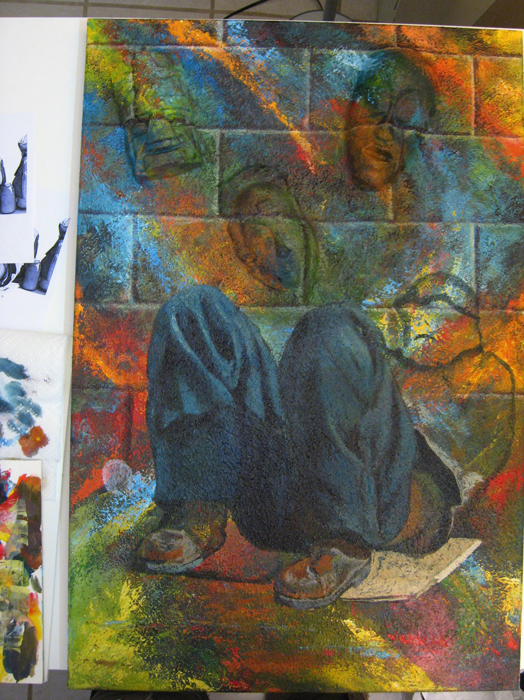 One of my good friends described my last piece, Hidden in Plain Sight, as being “in your emotions” and conveying “meaning that all of us can connect with”. 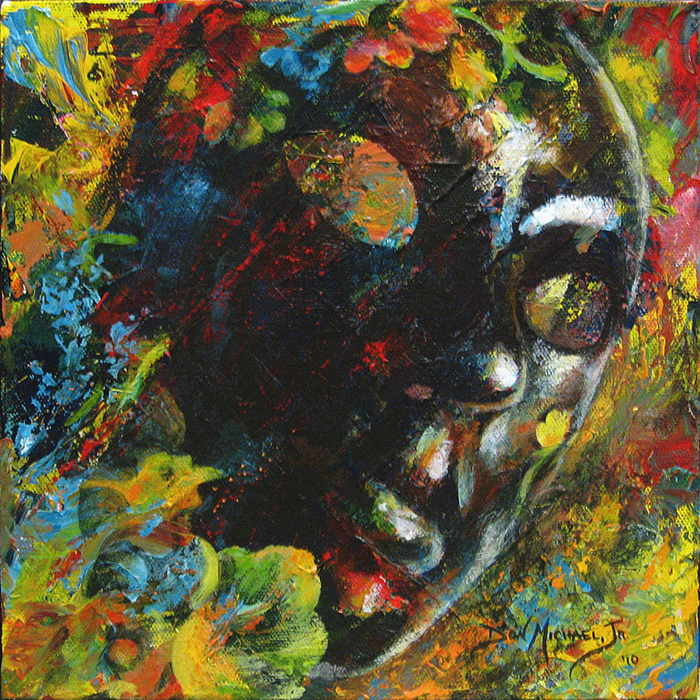 She specifically mentioned pathos, which she said the painting was “loaded with in a unique way”. I could not feel more proud. As is often the case, her words have described exactly what I was striving for. 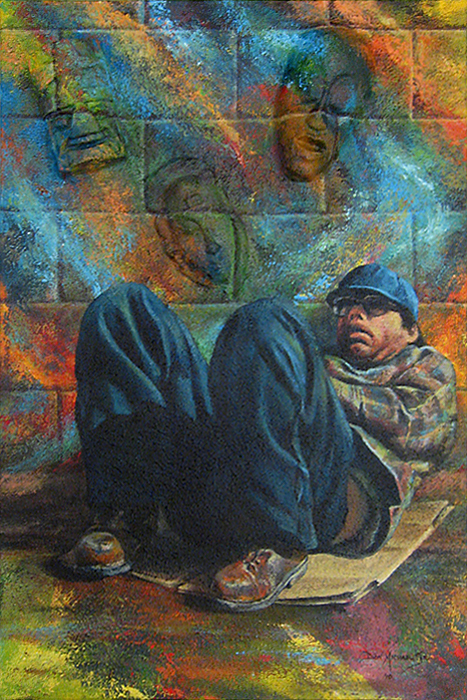 Several of my friends and family were so moved by the painting that they felt led to share their own situations in dealing with our all-too-large and seemingly hopeless homeless population. Every one of the comments I received here on my blog, on my other sites, and via email are sincerely appreciated. Needless to say, I found myself emotionally spent after all I had put into creating and then corresponding about Hidden In Plain Sight. 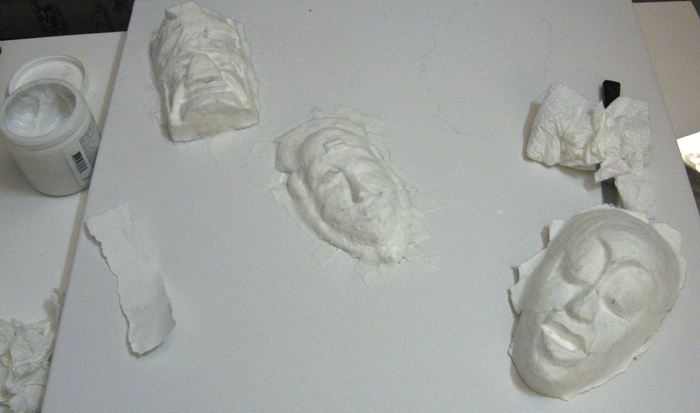 I even took a couple of rare days off from painting and instead focussed on designing future works to clear my mind. 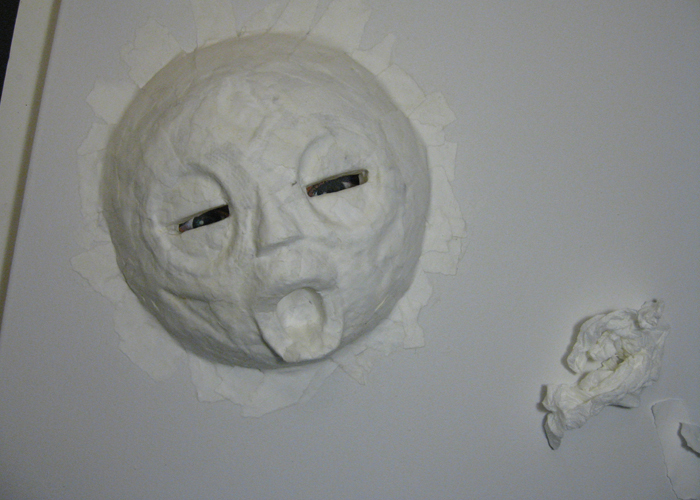 I decided I wanted my next piece to be light and happy with a focus on positive emotions. 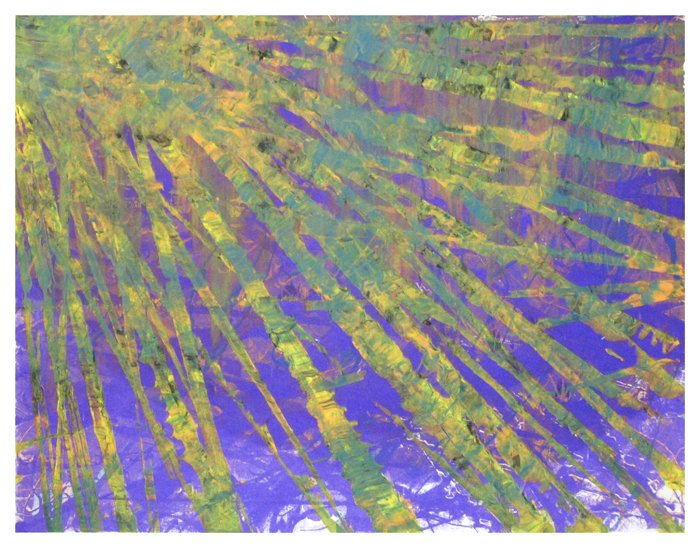 On that note, I took one of the ‘schmeerings’ generated during the creation of Hidden… and created an image which I hope brings a calmness and a smile to those who view it – I know it does me. 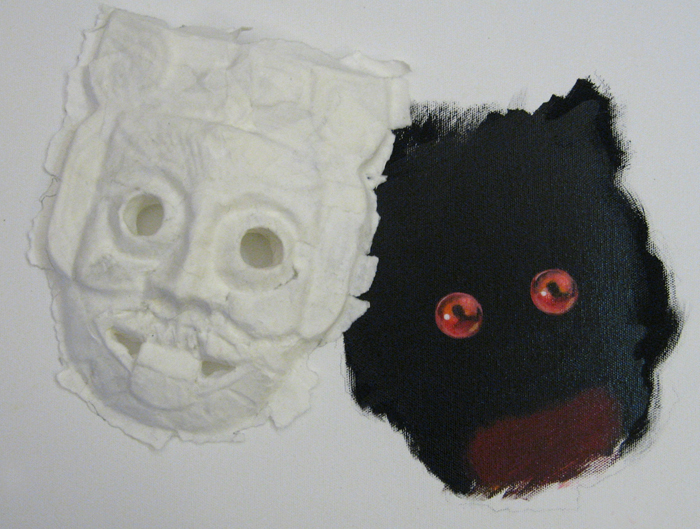 Below is the before and after of this Over the Under-Schmeerings painting. This was another of the ‘befores’ that was really hard to take to the next stage. But, I wanted to use the ‘calming’ of this intensely chaotic and lively abstract as a metaphor for what I’m striving for as an artist and as a person. I want to end this post by adding my own personal belief that as long as there is life, there is hope. I wish blessings upon all who have done their part to help alleviate the situations of those living on the streets. Although it may often seem overwhelming and thankless, keep up the good fight. Have you ever considered as you were driving by a homeless person in your comfortably air-conditioned or heated car how easy it would be to end up right there on the street with them? 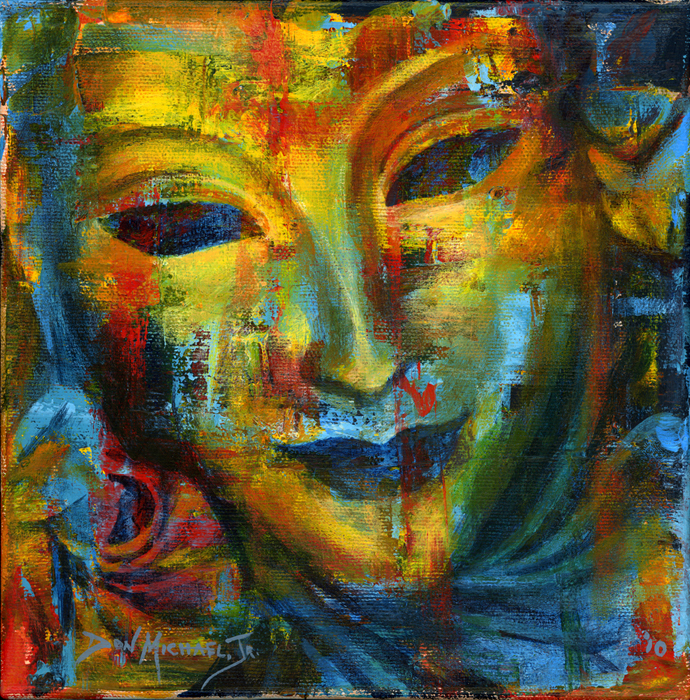 The human condition is so fragile that the right circumstances can send one spiraling out of control – emotionally, psychologically, medically, socially, legally and/or economically. It saddens me to think that personal demons can drive a person to the point of loneliness, despair and poverty – sending them out to fend for themselves in the streets. Regrettably, once they get to the streets they can become Hidden in Plain Sight . Completed 4-18-10 – ©2010, Don Michael, Jr.
After working out the composition in Photoshop I realized that I would need to incorporate some of my masks to help underscore the impact I was striving for. 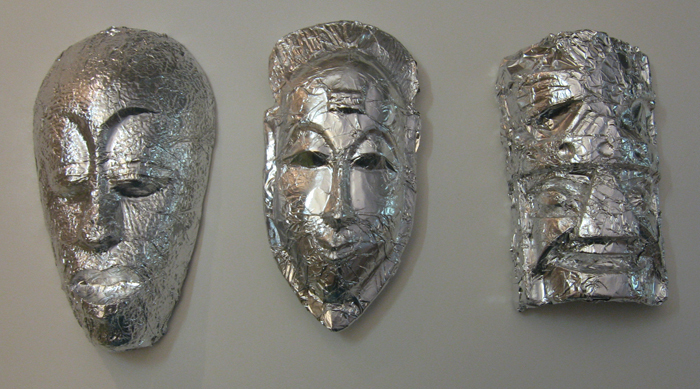 So I got down 3 of my smaller masks and wrapped them in foil. After peeling the foil, I arranged them on my canvas to determine their placement. 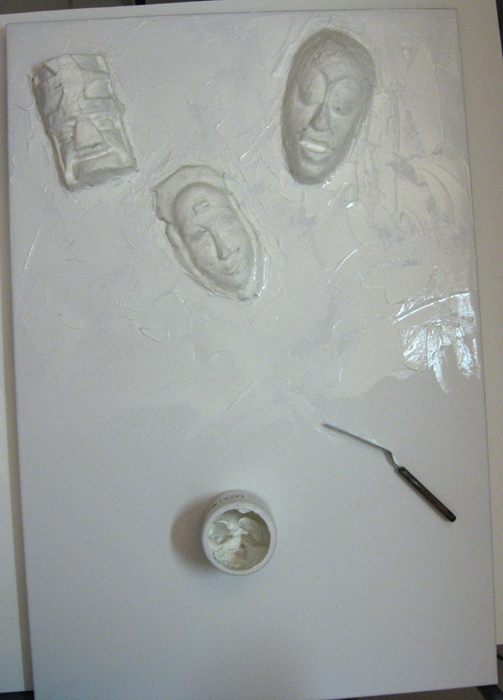 After penciling in their placement, I started adhering them to the canvas with the paper strips and acrylic medium gel. 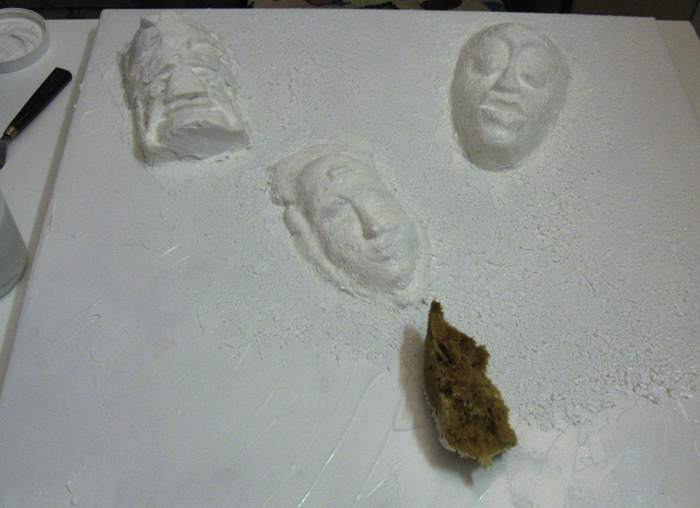 Once the paper mache’d strips had dried I started slathering on molding paste to camoflauge the seams. 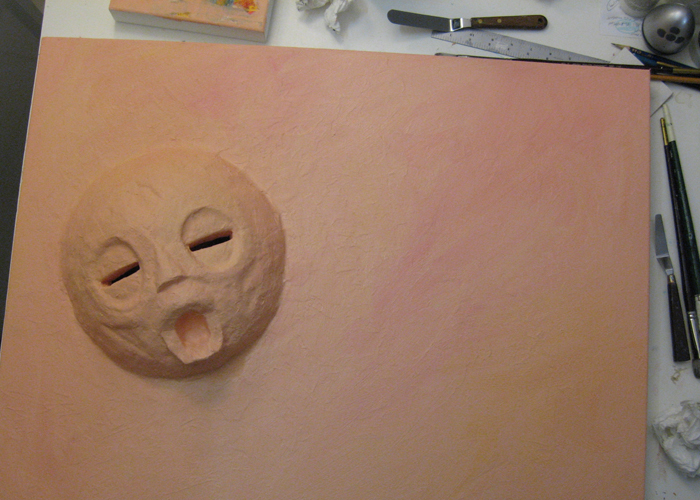 Before the molding paste started to cure I grabbed one of my natural sponges and started texturing the heck out of the whole thing giving it a stucco-esque look. 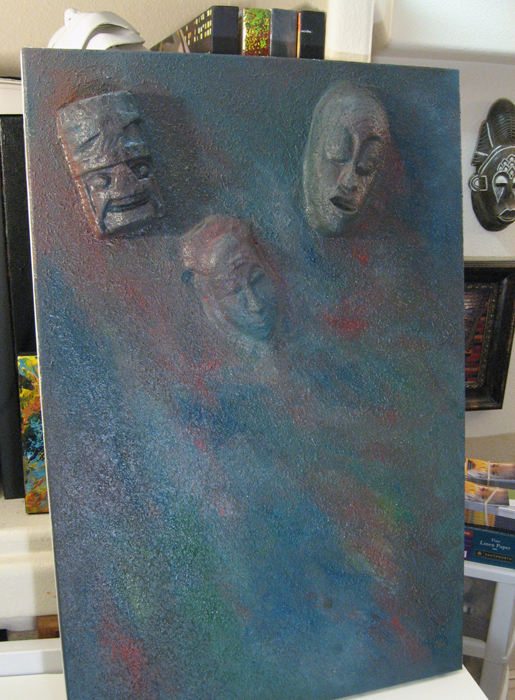 After the molding paste dried I squeezed neutral gray gesso, phthalo blue, cadmium red medium and cadmium yellow deep directly onto the canvas and proceeded to scrub it all together with one of my large flat bristle brushes to create the undercoat. 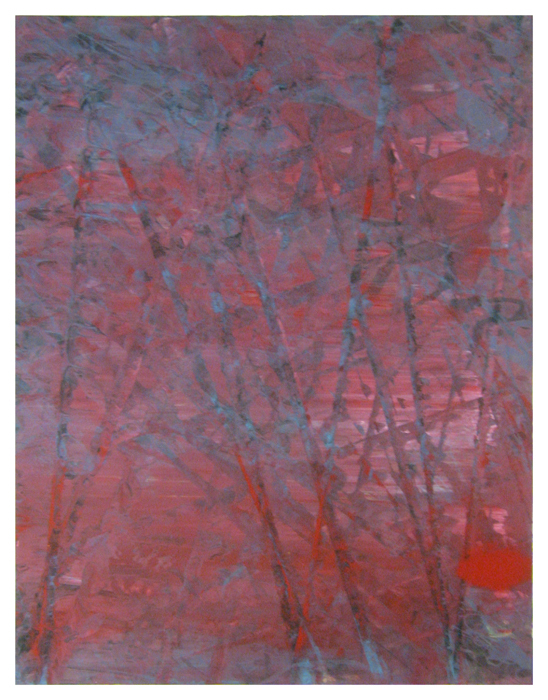 While the gesso was drying I took time out to paint one of my “Over the Under-Schmeerings” pieces titled Perennial. 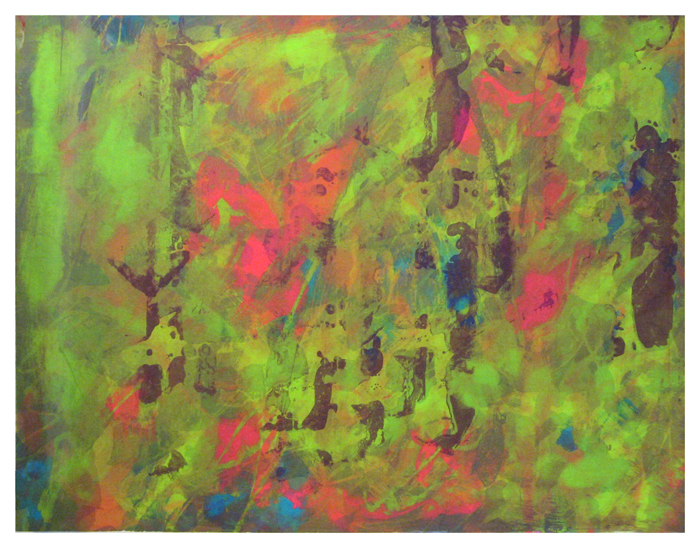 (Above, you can see its ‘schmeered’ canvas hiding just to the left behind this one.) After I finished with my little side-track I got back to work on this one by schmeering globs of pure color right onto the canvas. 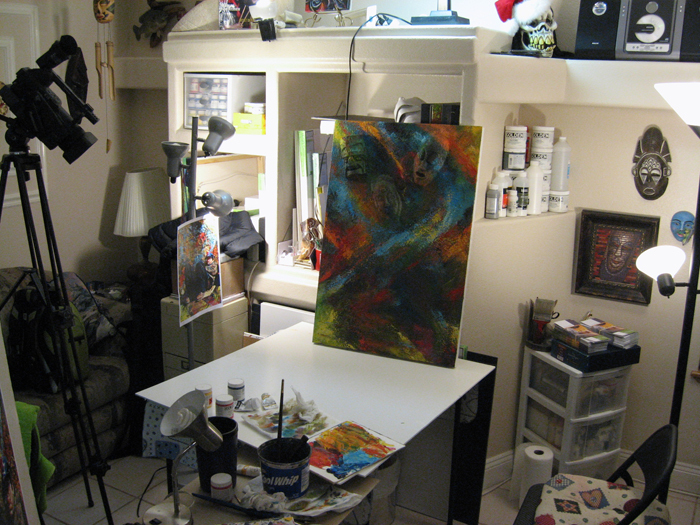 While this was drying I leaned it up out of the way and decided to take a few photos of my studio in action. You can see a clue to one of my upcoming projects in this shot. 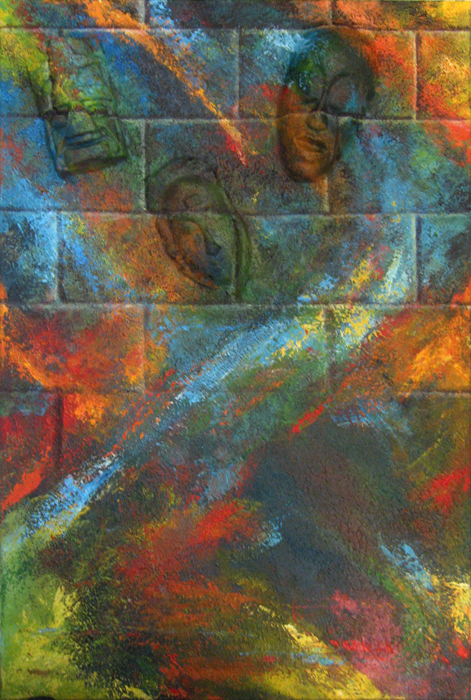 OK, back to this project… I painted in the lights and darks to delineate the bricks in the background. Using my bristle brush I blocked in the shape of my foreground figure and then started painting the pants, shoes and other elements. Continuing to move forward I finished blocking everything in and prepared to get down to the final details. 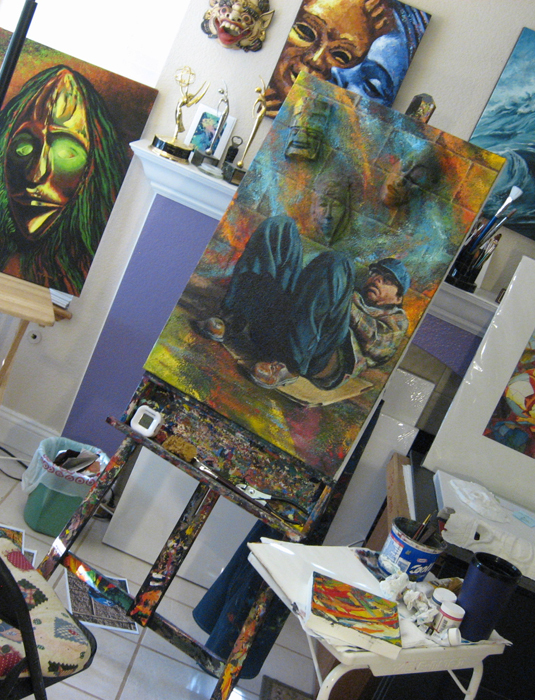 I thought I’d throw in one more shot of the studio in action, but from a different perspective. Among other things, you can see one of the two under-schmeering canvases that came to fruition during the creative process of this piece laying on the table there with the paints. From this shot I only needed to add a few details and tweaks, after which I signed it and applied a protective coat of matte acrylic varnish. I am currently in the middle of a couple of big projects which have prevented me from finishing anything new in the past few days. I’m really excited about how these projects are going and cannot wait to share them – hopefully soon. I cannot express enough how rewarding and enlightening it has been to go through these old pieces. They’ve helped me to revisit mentally, emotionally and spiritually where I’ve been artistically as I continue to blaze my current path. It’s truly been a case of looking back to move forward. 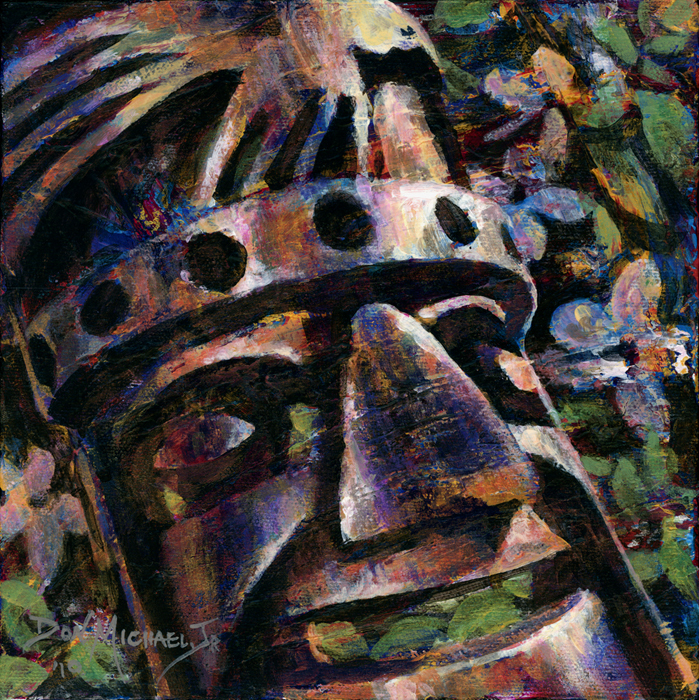 This latest piece from the “Over the Under-Schmeerings” series is the first to be larger than 8″x8″, albeit barely. 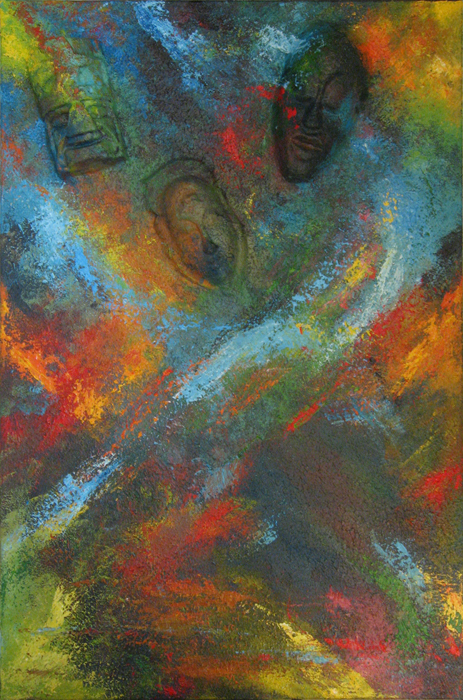 The schmeerings here came from the excess paint of several paintings being slathered and layered onto the canvas over the past couple of months. 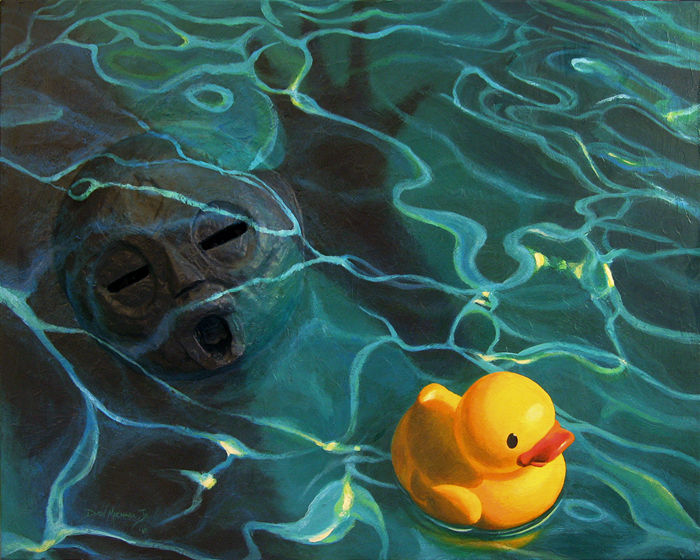 I kept no notes on the progression of this one, so there is no hierarchal chain to link it to its parent paintings. 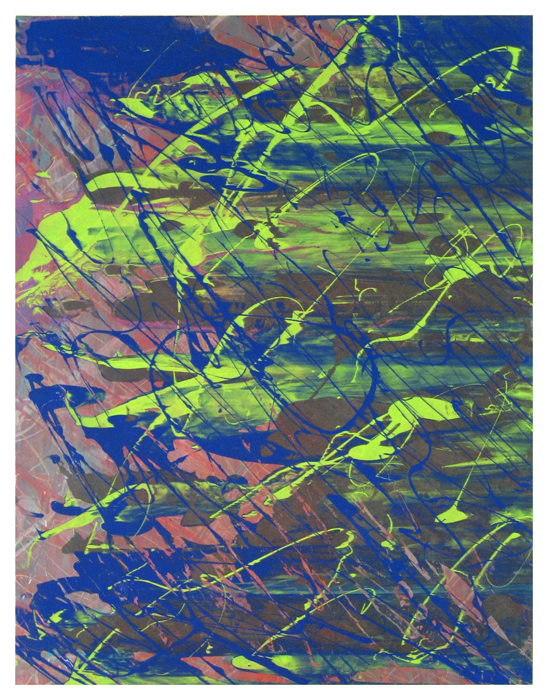 The last painting that donated to this piece was Adolescence, and since its colors were the most dominant I decided to stay with its color palette of Pyrrole Red, Cad Yellow Deep, Phtalo Blue – Green Shade, and Titanium White. Some of you may remember that back in December I griped about a painting that drove me so crazy I repainted it twice and finally gessoed over it – after which I went in a totally different direction to create what became Shadow of a Doubt. At the time I didn’t think I ‘d ever go back to this problematic concept. But, being a glutton for punishment and not being one to let a challenge go unheeded, I DID go back to it recently. 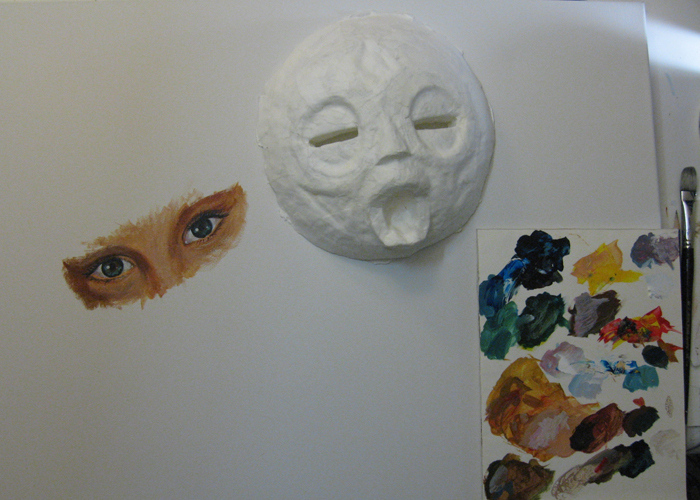 I added a new element, used a different paper mache’ mask, rearranged the composition and started painting. After three weeks of gnashing my teeth and ripping out handfuls of my hair (now you know why I’m going bald) I can finally call this project complete. 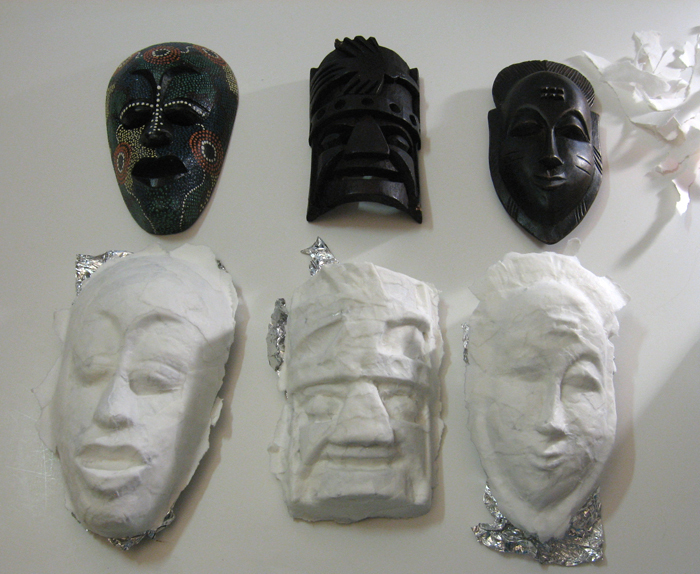 The mask in this composition was originally created by wrapping one of the masks in my collection with aluminum foil and then paper mache’ing over the top of it. Here it is, foiled and ready for some glooping. You can see all the strips of torn paper, the acrylic medium gel, the foil and my ever present and trusty palette knife gathered around and ready to take part in the fun. I didn’t get any photos during the glooping process. It’s a bit messy, as I’m sure you can imagine, and I want my camera to last a while longer. 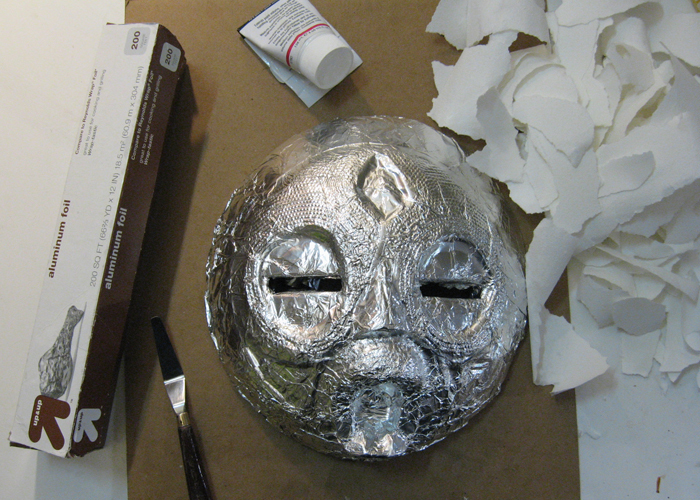 Therefore, the next photo we see below is of the paper mache’ mask ready to be adhered to the canvas. It waits patiently by the eyes I have painted to go behind it. You can see the mess that is my palette to the right. This past week was spring break for my wife and kids, so we had a wonderful “Staycation” which involved lots of fun family distractions. I also prepared for and took part in First Friday, a downtown art festival here in Vegas, which occurred this past Friday. The week culminated in an excellent Easter, which brought our 22-year-old son home for the evening. The family is not ready to get back into normal routines, but, ready-or-not, we’re all back at it tomorrow. 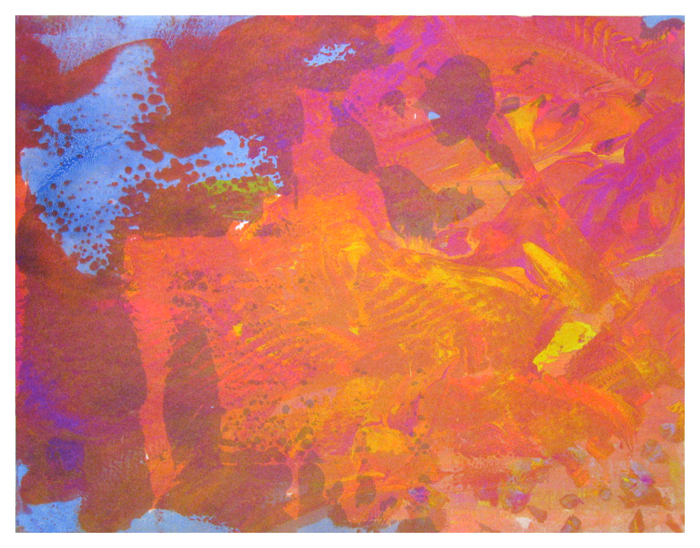 As you can see below, the colors in the under-schmeerings for this one were very rich and bright, which I found quite fun to work with. I tried really hard to allow a lot of the under-schmeerings to show through, but the subtle, yet elegant, beauty of this mask demanded a little extra presence. 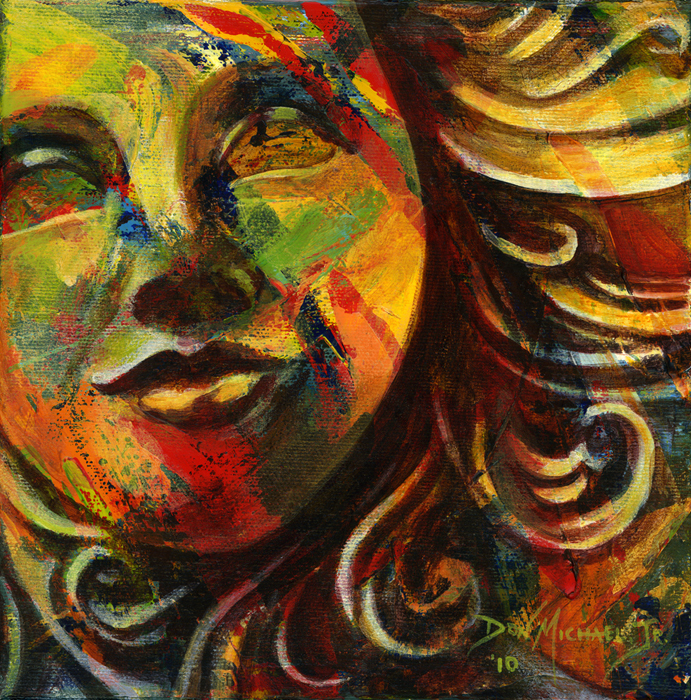 My daughter told me that this painting made her feel like this was about a lady who has lived a full life, but is starting to fade into her life’s experiences and memories. How’s that for some deep insight from an 11-year-old? Anyway, her proud father used this ideal to come up with the title, “Reflection”.